On a balmy winter evening as I entered the Ravindrabahrati auditorium, I was greatly surprised: For once, the backdrop of the stage at Ravindrabahrati was decked up with flowers pretty elegantly. Surprisingly, the speakers assembled on the stage too conducted themselves aristocratically by leaving the stage for the artistes quickly. Then came out the artistes, six women singers brightly draped in kanjeevaram silks to the left of the audience and three male singers to the right, and sat like a row of diyas in a crescent-shaped moon format. They were flanked on one side by the mrudangam and ghatam players and on the other side by a violinist and a veena player. The stage was thus well set to treat the audience with a musical presentation of Pallaki Seva Prabhandam. 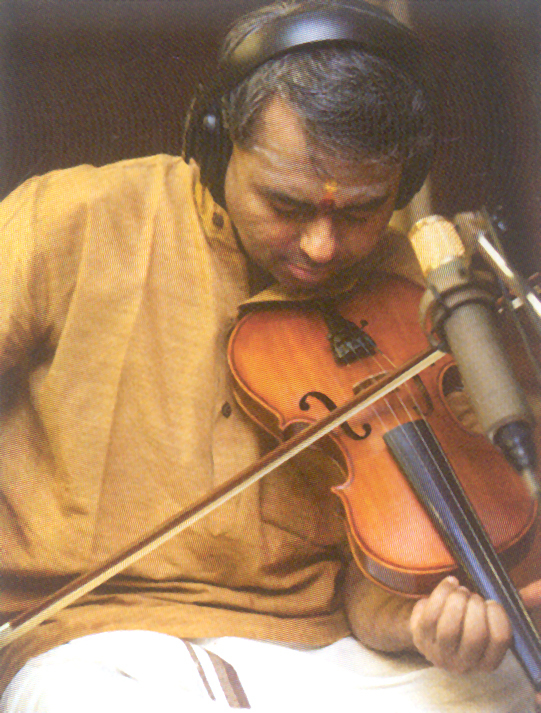 The fast plucking of veena followed by slow paces, that rendered soothingly soft but crystal clear twanging sound that ultimately diffused into silence, is with what the presentation of the Telugu lyrical beauty – Gowri Sankara Pallaki Prabandhamu – written by Sahaji I, started. Before going into the musical presentation proper, let us first spend a few minutes on the Prabandhamu itself. Interestingly, Sahaji was a Maratha king. He ruled south India from Thanjavur as his capital during 1684-1712. Few of us know that this Nayaka king, who was a great patron of art, artists and literature, wrote two magnificent operas namely Gowri Sankara Pallaki Seva Prabandhamu and Vishnu Pallaki Seva Prabandhamu in praise of Lord Siva and Vishnu in Telugu—that “has for long been the language of literature and music in south India”— richly decorating them with metaphor and elegance. Prabandhamu has a different meaning in literature and music. As a musical Prabandhamu, it is set to raga, where metre is important in the lyrics but not tala. Thus, Sahaji used different metres in the Prabandhamu: Dvipadas - 4, Seesamu - 1, Kandamu - 6, Teta giti - 2, Champakamala - 2, Utpalamala - 2, Daruvus - 19, Lali - 1, Mangalam - 1 and Prosaic dialogues - 5. The author has exquisitely studded the prabandhamu with such gem-like adjectives, particularly, epithets to describe the regal splendor of Parvati and Shiva, and allusions that it effortlessly evokes the sensibility of the poetry. The lyrical beauty of these Prabandhamus, that are richly adorned by ‘yati’ and ‘prasa’ duly accompanied by lots of alliteration, lies in their awesome musical evocation. This dramatic composition is set to be enacted with music and dance. The story narrated by the Prabandhamu is very simple: Parvati being unable to bear her separation from her Lord, Shiva, sends her sakhis —hand-maidens to him with a message of her request for his return. 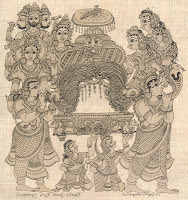 Accordingly sakhis go to him to deliver the message but find him busy in koluvu—the king’s court—as depicted by the first daruvu – ‘koluvaiyunnade devadevudu’ set to rag Sankarabharanam. They wonder: etula rammandunoyamma (set to rag mohanam)— how can we ask him to come when he is busy otherwise? As the time is passing, wondering at the bind they are caught in, they decide to convey the message through his ornaments. They first think of approaching Sankara through Ganga, but immediately realize that she is unfit, for she is capricious and is a puttugayyali, born arrogant, besides hryudayesu nadu netti nekki natinchu—crowning her lord and dancing on his head. They then look to the ‘little deer’ in Shiva’s hand but wondering how an animal can understand the nuances of carrying a message to the Lord, turn their attention to the snake that is adorning Shiva’s neck. Here again the sakhis, cogitating how a—rendu jihvalu galavarala kedanaina galave nenarul— double-tongued snake could appreciate the sentiment of love, desperately turn to the moon. But they find that the moon, the maternal uncle of the formless God of love, is equally unfit to convey the message. Thus the sakhis finally approach Shiva directly attempting to attract his attention to them. They implore him: “O dinamandara! O dayasagara! Accept her [Parvati] … who in your separation, is frightened even by a gentle breeze …O Lord! She … like a delicate creeper waiting for your support….”(set to rag Yadukulakambhoji) Here, the mellifluousness of accha Telugu words pops out when Sahaji studs the pallavi with words: “elukovayya cakkanayya talaledayya ma bala / elukovayya inta tadavela ravayya” (set to rag Saurastra)— My sweet Lord / take care of her / She cannot bear this separation / our tender lady / so why this delay? / Take care of her. Heeding to their pleadings, ‘Lord calls the court to a close’ and orders for a pallaki to go to Parvati, his consort. As he proceeds in ‘singarapu pallaki’ duly attended by Devas in different ways, the sakhis caution the pallaki-(-palanquin) bearers thus: kadalimpakuroyi pallaki kadalanikuroyi cala … haruvuga mellamellane adugulidaroyi ma / puravairiki badalika puttaboyyini a a … tinnaga nadavaniyaroyi tivaramelaroyi kuksi / nunna brahmandamulella nugaboyyini a a…(set to rag Nadanamakriya)—“Don’t swing the pallaki so! / Don’t be overly brisk / …Step gently / do it right / so Shiva may not tire…walk steady / don’t hasten the pace / the three worlds inside the lord / would be dazed.” What an imagination and how lyrically put across! As Shiva reaches the abode of Parvati, they welcome him singing—jaya jaya salakala girvana padaravinda / … / jaya jaya tyagesa Namaste Namaste namaha (in rag Kuranji)— O Lord honored by the Devas Hail! / Hail! Lord Tyagesa! Homage, salutations!” With affection and tenderness the sakhis announce the arrival of lord. Then the poet quite exquisitely describes how Parvati dressed up to receive Shiva. As Shiva receives the heccharikas and parakus as prayers from the Devas, Parvati moves forward to welcome Shiva thus, “natana sikhamaniki anjali …” —offering salutations to the cosmic dancer and praising him profusely. 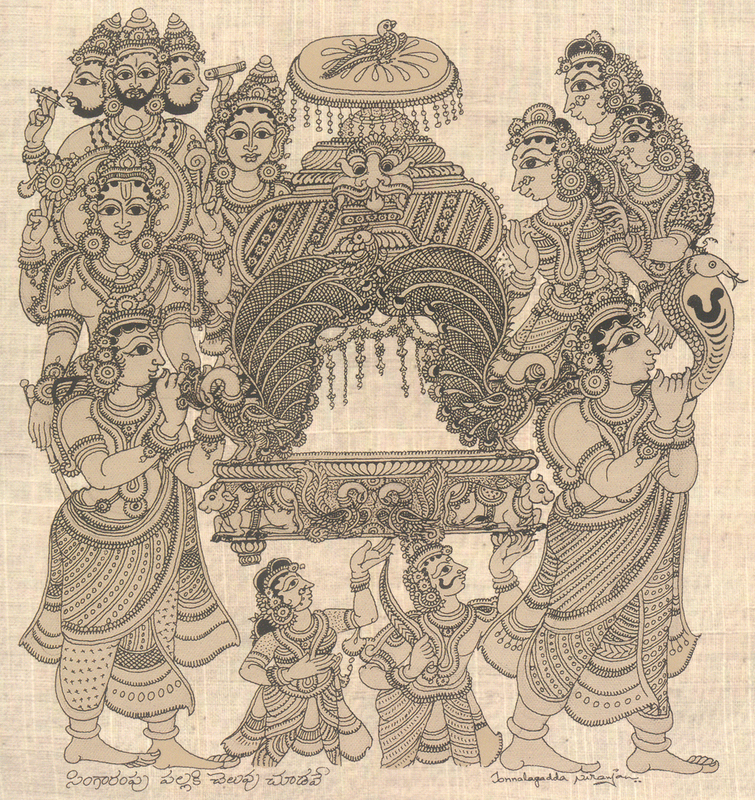 Then the poet describes Parameswaruni aragimpa seva – the serving of feast to the lord. The sakhis praying, aragimpavayya mrokkemayya - mayayya / kurmi gaurito kondaviti jangamayya (in rag Nadanamakriya)—Accept the feast / we bow to you, father, our teacher / along with Gauri, dear wonderer”, serve him pongallu, varugulu neti burelu, uragayalu, kuralu, payasamu, paramannamu, dadhyodanamu, pulihoralu, migada perugu, melaina sonthi majjiga… scented water and sweet-smelling betel leaves packed with camphor and nuts. The poet then describes Paramesvaruni pavalimpu seva – how he is being served as he rests. The poet addresses a lali, lullaby to Shiva, an unusual concept in the literary traditions: “lali lalayya lali / lali vrusabhaturanga lali bhavabhanga / lali karunapanga lali dhavalanga”, intriguingly set to Madhyamavati raga rather than to Neelambari. Then the sakhis plead with Parvati to “battito devadevaduni padapadammu lottumi / … / alayakanu devadidevunikanandamuga rati gudimi” (in rag Punnagavarali)— press the lotus-feet of the lord, devotedly / …/ serve him, tirelessly, be with him happily. Then as the Lord and his consort retreat into quite companion, the sakhis alert the protecting ditties, Ganesa, Bhairava, Bhadrakali and Ayyanar , thus singing – "kanakadri capudu gauri sametudu enasi sayyanu sukhiyimpucunnadu / venakayya namata vinavayya heccarika panivadi munijamu bari tirugavayya / hoho enarayya o surulara…” (in rag Saindhavi) – He rests with his wife Gauri / who used the golden Meru as a bow / Ganesa! Heed my words / turn back / Take care, O’ Devas! Stay alert, O’ Ganas! / The first quarter of the night passes by. This great musical Prabandhamu that, which is full of musical accha Telugu padams, words, has somehow survived the vagaries of history through oral transition, has been finally taken up by Smt. R Vedavalli, ‘Sangita Kalanidhi’ of Carnatic music, to present in its full form – daruvus, vrittams, and vachanas —in commonly sung ragas that are appropriate to the lyrical poetry in Telugu. It is this opera, conceived and directed by Smt Veadvalli, that was presented on 21st November at Ravindarabharati by her disciples. Vedavalli’s team rendered the Prabandhamu, both individually and in groups. The musical presentation was interspersed with English commentary, explaining the story that enabled the audience to well visualize the scenes. The presentation was indeed impressive. But for the woman singers’ hesitant attitude in taking off with no delay that resulted in too long pauses here and there and the immediate repetition of ragas at some places that dented the thematic presentation, it was a pleasant experience to the audience. I pity the male-singers… they were to sit idle on the dais for most of the time, except for singing one or two compositions, which, of course, they did extremely well; indeed listeners like me looked forward for more from them.The accompanists, Arun Prakash on mridangam, Guru Prasad on ghatam and Sri Ram on the violin, did a perfect job. The veena, however, remained obscure, perhaps, because of the sound system… otherwise Smt. Ramani did an excellent job, at least that’s what I felt listening the CD. Overall, thanks to the SICA, it was an enchanting evening. The organizers of the whole project, particularly Smt Vedavalli R, Smt. Annapurna Mamidipudi, and Smt. Sumathi Krishnan, deserve all our compliments for bringing out the Prabandhamu in book form along with the CD and presenting it live. I am sure, Vedavalli ammal and her disciples will be thanked by the Telugu fraternity for their pains taking efforts in presenting this Prabandhamu in digital format in full. 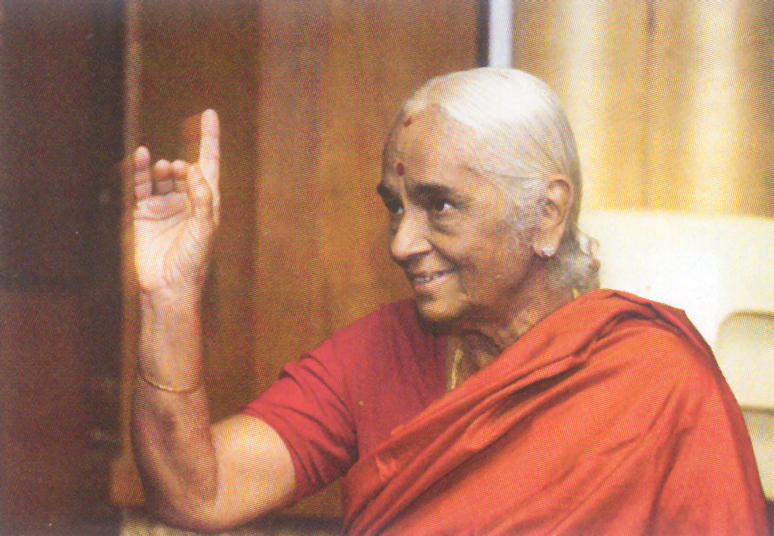 Key words: Sangita Kalanidhi R. Vedavalli, Pallaki Prabandhamu.